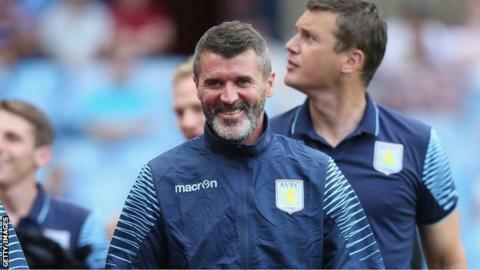 Roy Keane says he in the summer because he was unimpressed with the offer made by the Scottish champions. Celtic deny making Keane a firm offer to replace Neil Lennon but he insists the club's majority shareholder Dermot Desmond told him the job was his. "Celtic wanted me but they weren't showing how much they wanted me," said Keane. He adds that the contract offer "failed to rock my boat". Writing in his new autobiography 'The Second Half', the former Ireland skipper says the club's negotiating tactics reminded him of the talks when he agreed to sign for Celtic in 2005 as he neared the end of his career. "They were playing the part - 'It's Celtic' - you should almost go up there for nothing," writes Keane. "I felt powerful saying: 'No'. I felt good. But I wondered if I was making the right decision. Right job, wrong time"
"I got a call: would I go and have a chat with Dermot Desmond? I'd met him once before, in 2005, when I was signing to play for Celtic. "At the end of the chat, he said: 'The job is yours'. "It was all pretty straightforward. There would be one or two restrictions, about staff. They had already picked the man who would be my assistant and they were insisting on him. "It didn't scare me off but it did get me thinking. It wasn't an ideal start. Were they doubting me already? "Over the years, I had always said: "If you're offered the Celtic job, you don't turn it down". "I was in a predicament...and my gut feeling was saying: 'You're on your own with this one'." The 43-year-old, then assistant manager of the Republic of Ireland, continues: "I asked Paul Gilroy, the League Managers' Association lawyer, to speak to Celtic to discuss terms. Money hadn't been mentioned yet. "I got in touch with Celtic's chief executive, Peter Lawwell, and asked him to give me a ballpark figure before negotiations got going. "He mentioned a figure and he said: 'But that's it'. Paul told me there were a lot of clauses in the contract that he wasn't happy with. And the figures were non-negotiable. "I got my head around that. But it felt a bit too familiar. I had been down this road before when I signed for Celtic as a player. "I felt they wanted me but they weren't showing how much they wanted me. It wasn't rocking my boat." Keane says he called Desmond to say he was "really honoured" to be offered the job but that he was turning it down. in early June. The current Aston Villa and Republic of Ireland assistant manager adds: "Had Celtic shown enough in their negotiating, I might have hesitated. "They just didn't show me that they wanted me and I was happier staying in the Ireland job. "I felt powerful saying: 'No'. I felt good. But I wondered if I was making the right decision. Right job, wrong time."